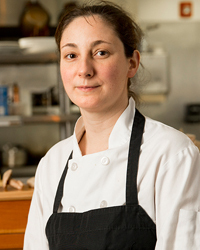 Why She's Amazing: Because she's injecting fun and creativity into Portland's already successful farm-to-table model. Her unexpected yet winning ingredient combinations include fried chicken skin, bitter greens, watermelon and baba ghanoush. Advice for Young Chefs: "Cook as much as you can at home, play with spices and flavors, and try things that you don't think would work... You need to hone your palate on what works together and why it works together. Every time you make something bad, you'll come up with an idea for something that's good." Second Chances: The original Aviary was badly damaged in a fire on July 4, 2011, (victim of an illegal firework) after being open only a few months. With help from other local chefs, Pliner and her partners, Jasper Shen and Kat Whitehead, reopened the restaurant just five months later. Less than a year after that, Willamette Week, a local newspaper, named Aviary Portland's Restaurant of the Year.